Borsbeek (Belgium), 21 September 2018 - New technologies are coming onto the market. Often they are not ready for this. To prevent this, the Province of Antwerp (Flanders), the Province of Limburg (the Netherlands) and the stakeholders from the greenhouse horticulture sector are joining forces. Together they will become new energy efficient and climate neutral. Our companies are on a rollercoaster of innovations. Technology is becoming increasingly important and drives more industrial operations to be automated. For example, in greenhouse horticulture, where organic vegetables and vegetables. A technological revolution that never stops. Continuously new technologies will be put to work on the greenhouse horticulture businesses themselves. Provincial deputy for Agriculture and Innovation Ludwig Caluwé: "The problem with many new technologies is that they are not ready for use, there are plenty of adjustments before they can fully perform on a company, and that takes time and money. exchange technologies The Interreg project GLITCH is the first project where we - along with stakeholders from two neighboring countries - take the development of new technologies into our hands. " 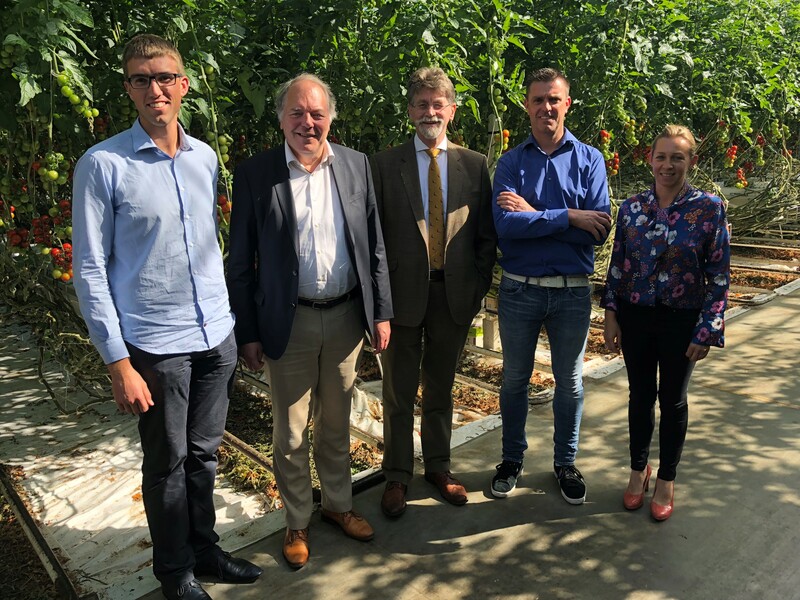 From left to right: Bart van Calenberge (project leader GLITCH), Mr. Caluwé (deputy Province of Antwerp), Harm Waterborg (Deputy Province of Limburg), Bart and Kathleen Peeters (tomato growers). Working together with growers, technology companies and research institutes and two neighboring countries on a new, special technology. It is a fairly new approach within the agricultural and horticultural sector. However, pools from research that cooperation with external parties has a positive effect on the chances of success of an innovation. "We are very conscious of the slag, we believe in its success and we want this co-creative approach to be within the greenhouse horticulture sector, and we are very much looking forward to working with our Dutch colleagues. By joining forces we will undoubtedly come up with beautiful, practical innovations ", according to deputy Ludwig Caluwé. These new, ready-to-use innovations ensure that more energy is generated and climate-neutral production in the greenhouse horticulture sector. Dutch representative for Economy and Knowledge Infrastructure Joost van den Akker: "The return on climate objectives is a challenge for every company, and a great deal of effort has been made in the agricultural and horticultural sector, and we are aware that there are many opportunities. The great thing about the Interreg project GLITCH is that it does not focus on one technology, but the company has several developers, so the sector can take serious steps in a short time. "